Yesterday, several roads around Melbourne’s Fishermans Bend precinct were permanently closed off for the commencement of major construction works. The project in question is a new community park, measuring 8,000 square metres, that will transform the former industrial site along Buckland Street in South Melbourne. 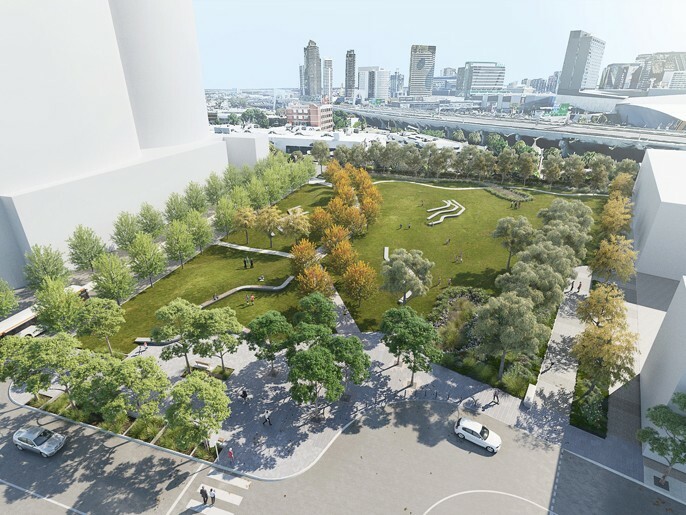 Four separate green areas will make up the Fishermans Bend park – to be called Montague Public Park until its public unveiling, when it will be renamed – which will additionally feature LED lighting, garden plots, public seating, footpaths and paved entrances. Development of the project will be staged, with basic amenities anticipated for completion mid-2018. Following this, a community consultation project will be launched to determine further elements that could support a diverse range of recreational uses. The wider Fishermans Bend precinct is also set to include Victoria’s first vertical primary school. The government says this is “on track” to open later this year. Plans for the school combine a day-care kindergarten, maternal and child health services, multi-purpose rooms and sports courts that will be available to the public. As Montague Park is being built, road closures will affect Ferrars Street between Gladstone and Douglas Streets, and Gladstone Street between Kerr and Ferrars Street. Parking along Kerr Street will also be limited.